Women’s apparel is the major and largest segment of the global women’s wear including footwear market and bags market and the women apparel market contributes more than three-fourth of the global women’s wear market. Clothing is the basic need and with the changing lifestyles and fashion sense there is an increase in the global women apparel market. Luxury clothing is expected to grow in terms of sales as compared to the mass market. With the launch of trendy clothes accompanied with distinct fabrics, patterns and styles the global women apparel market is booming. In recent years, companies like ModCloth, Eloquii, and Fashion to Figure have emerged to sell fast-fashion trends to women online and these brands are cashing in – plus size women are twice as likely to shop online than other women, and buy 50% more of their clothing online than their “standard” size counterparts. Goldstein Research analyst forecast the women apparel market size is set to reach USD 680.17 billion by 2024, growing at a CAGR of 4.0% over the forecast period. This market is highly intricate and is majorly driven by the inherent desire to keep pace with latest fashion trends. The report covers the present ground scenario and the future growth prospects of the Women Apparel market for 2016-2024 along with the revenue generated from the retail sales and the number of vendors in the global women apparel market. We calculated the market size and revenue share on the basis of revenue generated from major players across the globe. We estimated the market size from the online and offline sales of the products, in addition with the total number of retail stores and online portals to buy the women apparel. On the basis of product type, largest revenue share of 38.2% in the global women's clothing & apparel market is accounted by tops in 2016 and is likely to maintain its dominance throughout the forecast period. This segment accounts for the third-highest growth rate among other women apparel products with relatively high buying frequency. Due to the frequent shifts in fashion industry tends the women tops to continue to grow as they are the linchpin of almost all the outfits. Women apparel market outlook 2016-2024, has been prepared based on an in-depth market analysis from industry experts. 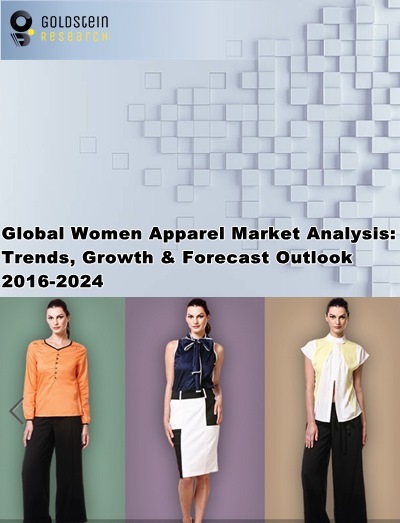 The report covers the competitive landscape and current position of major players in the global Women Apparel market. The report also includes porter’s five force model, SWOT analysis, company profiling, business strategies of market players and their business models. Global women's clothing market report also recognizes value chain analysis to understand the cost differentiation to provide competitive advantage to the existing and new entry players. Our global Women Apparel market report comprises of the following companies as the key players: Gap, H&M, Inditex, Adidas, Burberry, The TJX Companies, Inc., Marks and Spencer Group plc, Benetton Group, Pacific Brands Limited, Etam Developpement, Fast Retailing Co., Esprit Holdings Limited, Aoyama Trading Co., Mexx Group, Arcadia Group Limited, NEXT plc and Nordstrom, Inc., Forever21, French Connection and Guess. Other high-flying vendors in the market are: Nike, Louis Vuitton, Gucci, Prada, Michael Kors, Ralph Lauren, Uniqlo, ZARA, HUGO BOSS, DIOR, Donna Karen, Calvin Klein, Tommy Hilfiger, Lacoste, Hollister, Puma, Abercrombie and Fitch and Chanel. According to our global women apparel market study on the basis of extensive primary and secondary research: “One of the major trends in the global women apparel market is the ultra-affluent working women who are more inclined towards the luxury brands. With the high paying jobs and increase awareness in the global fashion arena the demand for luxury clothing and accessories is increasing and registering the market share of 30.9% in 2016 as women have better spending tendency and are more conscious about their appearance. According to the report, major driving factor for women apparel market is the expansion of online distribution channel through various social media platforms such as Facebook, Instagram, Bloomingdales, EBay, Amazon etc. and is estimated to reach USD 10-12 billion in the forecast period. More colors and designs are offered by the brands to focus on ‘higher brand proliferation’ such as Fabindia Overseas Pvt. Ltd, India’s largest solitary brand apparel retailer, offers over 500 designs and more than 20 colors, while global fashion giant Zara offers 322 designs and 15 colors. Further, the report states the major challenge in the global women apparel market is the rapidly changing profile of consumers. With the increase in the fashion awareness because of the various social media platforms the demand for more fashionable and trendy clothes is increasing every day making it a challenge for the retailers to keep up with the evolving shopping demands of the consumers. Based on geography, Europe held the largest market share i.e. 41.0% in global women apparel market and reached the valuation of USD 125.9 billion in 2016 due to increase in number of fashion conscious consumers as women make up the 51.1% of the Europe population. North-America being the second largest women apparel market after Europe growing at a CAGR of 2.75% over the forecast period. However, Asia-Pacific is expected to grow with a CAGR of 6.0% over the forecast period due to fast growing economy and increase in young population. Countries like Japan, Sweden, Italy, United States, France, United Kingdom, Australia and Brazil are opportunistic market as brand association is more with design language, style and design are the top considerations in these countries. What is the revenue of women apparel in 2015-16 and what would be the expected demand over the forecast period?